Generally, the 3DC don’t speak much about cocktails and rather prefer to imbibe in the dram straight, neat of course. But there are indeed cocktails we enjoy, one of them being the traditional Manhattan. So what to do once your 2 liter barrel has aged two runs of whitedog whiskies and is essentially spent when it comes to aging bourbon? 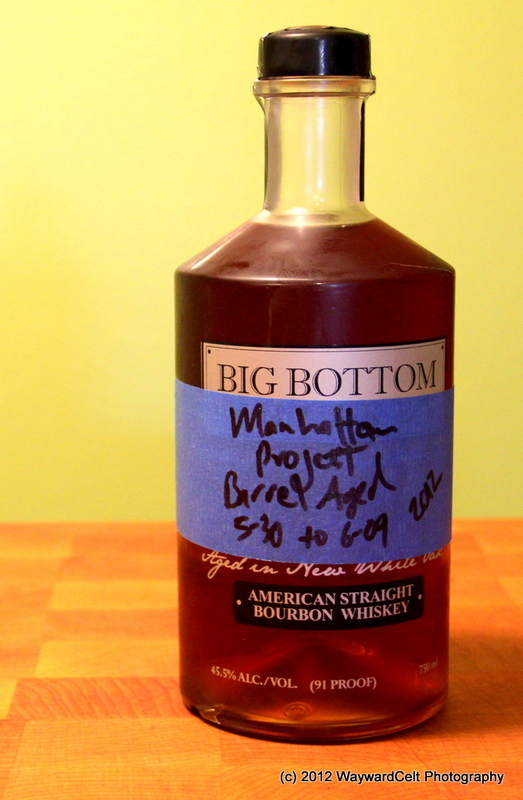 Well, you take a page out of Jeffery Morgenthaler’s blog (soon to be book), and barrel age your Manhattan, obviously. Once the 2 liter barrel was filled, this recipe yields an extra 750ml bottle of finished cocktail plus enough for one drink while I’m cleaning up… You may wish to scale down the recipe slightly if you don’t wish to have that much extra. In my case I wanted to see how the same cocktail faired in glass versus barrel storage, so having a bottle extra worked perfectly for me. I filled my barrel and promptly forgot about it for a week. To my utter shock and surprise, when I remembered to test a sample a week and a day later, the change was remarkable. So much so I opted to halt the experiment then and there, bottle up the first run, and mix up a second batch. Because of the large difference I tasted after only that first week, I was hesitant to keep it in the barrel any longer for fear of getting too much oak and tannins from the wood in the final cocktail. As it stands after only a week, the cocktail has pulled a nice mild smokiness and woodiness from the barrel while at the same time marrying the vermouth, bitters, and bourbon into a single entity rather than three distinct parts. A comparison of the glass bottle cocktail aged for the same length of time shows the marrying beginning to occur, but only in its infancy stages after a week. Obviously the glass version doesn’t have that deeper richness imparted by the 2 liter oak barrel either. The difference a single week in the barrel made was a spectacular showing of just how distinctly different barrel aged cocktails can be from their normal counterparts. I enjoyed the outcome of this experiment so much so that batch 2 is now resting in the barrel, perhaps for even a bit longer this go around. After that I may experiment with only barrel aging the vermouth rather than the entire cocktail (a suggestion from Ted Pappas of Big Bottom Whiskey) based on the fact that the bourbon is already oak aged but the vermouth is not. The only component missing being the time to marry the ingredients, which could then be done in a neutral vessel like glass. This entry was posted in Miscellany and tagged barrel aging, big bottom whiskey, cocktails, experimental. Bookmark the permalink. That sounds really interesting and I would like to try some! Do you still shake it with ice before you drink it? As for serving, I just keep a bottle in the fridge now, so I add some cherries and pour; no ice needed. I’ll be sure to bring a bottle next time we meet up! I like the frothy ice chips on top that come with a good shaking. It also cuts it with water a little bit. Oh no. I realized I may have just opened a shaken vs. stirred debate. I am not a connoisseur. I just knows what I likes. Not from me 😉 I’m not that particular with my cocktails. I don’t do ice in my Whiskies, but that’s the extent of my debate. How long did you age your second batch? Any significant differences? Any other suggestions for a cocktail that would benefit from the barrel? The second batch went for two weeks instead of one. No appreciable change noticed, but since it was another continued use of the same barrel, I expected the same outcome from the longer time. The third batch is presently sitting on oak and has been since 6-24-2012, so we’re coming up on 3 weeks. I’ll sample over this weekend likely and determine if I want to keep it down longer or if it is time to bottle this round. Has anyone aged an old fashioned as of yet? I love my old fashioned and will be attempting this soon !! Do you recommend new or aged barrels? Also would you add the fruit for the aging process or wait to add it to the finished product when serving ?! Any advise would be appriciated ! I’ve not yet tried old fashioneds, but I’d expect they would do just as well as the Manhattans have done. For the Manhattans, I keep the cherries aside and add when serving, though to be fair they are also bourbon soaked so there’s some ‘aging’ going on there as well. I opted to keep fruit out of my small barrel as I wanted to reuse it without fear of mold or rot issues (not to say I have evidence there would be, just in my head it seemed like it could be an issue). As for new versus used barrels: I reused the barrel after two runs of aging whitedog whiskies in it. While the whiskies took the brunt of oak, I still find that the barrel is giving off a decent amount of oak and char into the cocktails as well, but not so much as to be distracting. If you have a new barrel, I’d suggest a first run where you check and sample every other day, as you will encounter fast changes, especially if using a barrel smaller than 5 liters. The more uses a barrel has been through equates to longer runs the next time for me. So While my first cocktail run went a week, this past 4th run was a solid month in the barrel with similar effect. Hope that helps! We’d love to hear/read your results of what you do!